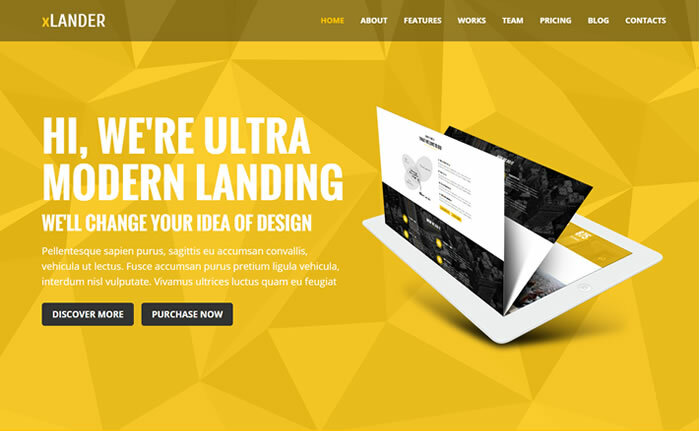 xLander is ultra modern one page WordPress theme suitable for portfolio, business, showcase and landing page websites. Built based on most advanced bootstrap 3 framework and available with 6 different home page layouts and 5 awesome colour schemes. xLander is fully responsive layout and its all elements are retina ready, so they looks great on high pixel density devices. Bundled with most famous and powerful Visual composer ($28) drag n drop page builder plugin give you ultimate control over your post and page layouts and Slider revolution ($18) plugin is very handy to build astonishing sliders so easily. xLander one page WordPress theme comes with powerful admin panel, lets you do changes such as colours, backgrounds, fonts, layouts and create custom skins without coding knowledge. Enabled with parallax support helps you to create awesome full screen sections and able to animate every element by using CSS3 powered animation shortcodes. xLander theme coded with valid W3C standards and best SEO practices in mind, which is key to ranks well on search engines. Theme bundled with .MO and .PO files that can be used for translations which means that ready to translate your website in any language based on your wish.